This week we record live at Kytons Bakery, Edwardstown, during their Hot X Bun production overload. While we’re here, we have Sharon Sutton, co-owner of Kytons Bakery, sit with us to talk about baking, food labelling, new product development and wine. You also hear about Steve’s April Fools’ coffee stunt which made The Advertiser. We have part TWO of our chat with political satirist, Andy Zaltzmann, who was in Adelaide the weekend before last for a sold out comedy gig at the Rhino Room. In the Made to Move Minute, Max Martin gives us some tips on surviving Easter, while in Time to Think, George Inglis reflects on Adelaide Oval vs the MCG. The music from Todd Sibbin and the Acadian Driftwood is topical, while recording in a bakery with, The Crying Cook and the Bleeding Head Chef. Longview Vineyard Yakka 2012 Adelaide Hills Shiraz. Tasting notes. Secondly, just write Yakka on our Facebook Page OR tweet it to @theadelaideshow OR email it to us at [email protected] BEFORE 11:59pm, Sunday, April 5, 2015. 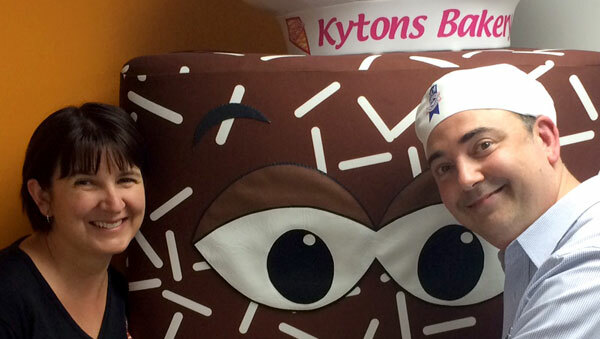 General introduction and chatter with Sharon Sutton, co-owner of Kytons Bakery. Andy is a Englishman who has crafted a career as a political satirist in love with Adelaide and the Adelaide Fringe. He explains his fascination and his penchant for church organs. And our song this week, The Crying Cook and the Bleeding Heart Chef, by Todd Sibbin and Acadian Driftwood, suggested by Adrian Miller from the Radio Adelaide Monday night music program, Songcatcher.